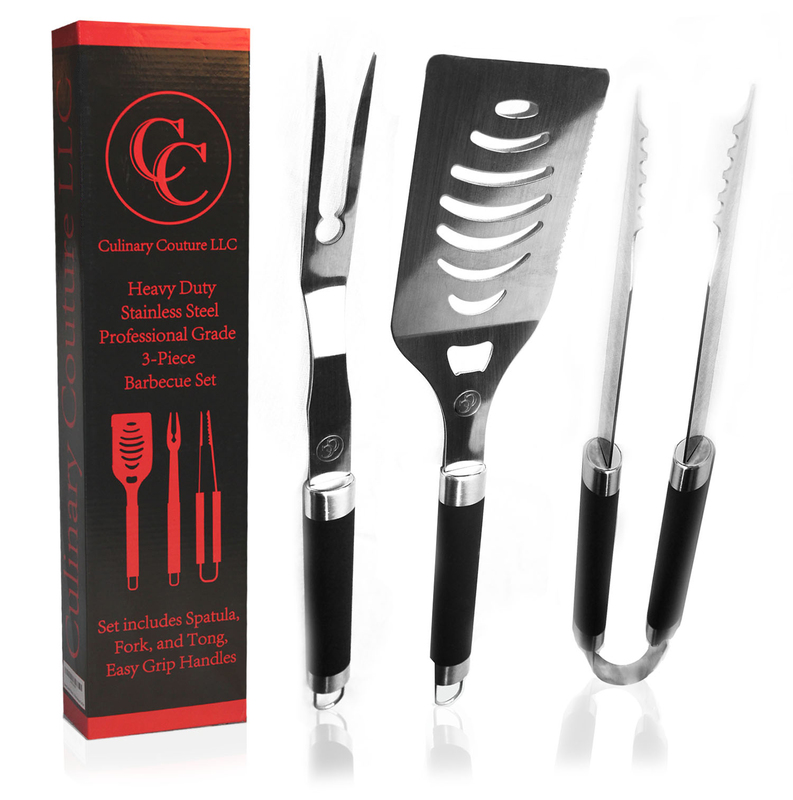 I just got this great BBQ set from Culinary Couture. This set is so nice, you get three different pieces that are all really well made and durable. You get a set of tongs, a spatula, and a fork. These are all large pieces, long handles that are great for the BBQ so you don’t have to get to close the fire. Stainless steel which is great to cook with, withstand high temperatures and is very durable. The handles are all very comfortable and easy to hold. The spatula and fork both have hooks on the end so you can hang them which I love, I usually put the tongs through the handle on the BBQ and hang up the other two on hooks I have attached to the BBQ so everything all together. Makes for easy turning of your food items regardless of what you are cooking you have a tool for it from this great set from Culinary Couture! PROFESSIONAL GRADE 3-PIECE SET: Heavy duty spatula with serrated edges helps cut large pieces of meat. The spatula boasts an oversized head to easily handle large pieces of steak. BBQ Fork and Tongs come with long non-slip handles to keep you protected from the grill heat. Once you’re all done grilling your masterpiece, convenient loops have been designed for easy hanging. PERFECT GIFT IDEA: Are you looking for a great gift for your dad, husband, boyfriend, uncle, ex-husband, groomsmen or any other grill master in your life? If yes, then this one would be a great option! The tool set comes in a beautifully designed gift box – it’s ideal for elegant and classy people. Great as a holiday gift, anniversary, or wedding present. SPATULA BOTTLE OPENER: It is of paramount importance to keep the grill master hydrated. Thats why you will love this convenient bottle opener right on the spatula. In between flipping burgers, tending to steaks or hot dogs, open up a cold one to keep the party going. Perfect for tailgating or backyard cookouts. SUPER EASY CLEAN UP: There is no need to spend time washing them. All 3 pieces are safe for your dishwasher. Put them in after you have finished your BBQ and let the machine do the work for you. Afterwards, just wipe them off or let them dry and take advantage of the convenience of their special hooks for easy hanging. GET A BONUS EBOOK: VALUED AT 10$: Not only you will get the best 3-piece BQQ set that will make your BBQ days more enjoyable, but you will also get an amazing eBook with recipes. This guide contains 55 delicious and easy to make recipes that will definitely satisfy your tastebuds. And they will absolutely impress your loved ones. ORDER NOW to take advantage of our SPECIAL SUMMER DISCOUNT!